The most important geographic feature of Newark is the Passaic River. It has been, and always will be, the most visual feature of the physical landscape of the city. During all the phases of Newark's 330-year history, the Passaic has been the center of activities. The river brought the Puritans to town in 1666. It was the centerpiece of commerce and transportation throughout the 18th and 19th centuries. It was the focal point of industry until well into the current century. And it played an important part in recreation, serving as both the neighborhood swimming hole and as the site of important East Coast regattas. 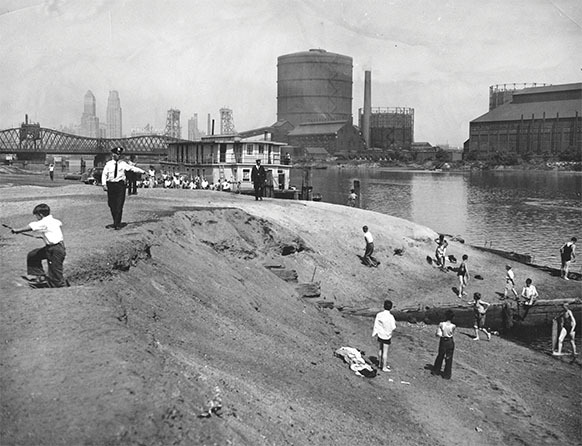 Pollution from heavy industry and the damage wreaked from sewage nearly killed the river in this century. But reclamation efforts have done much to reverse that unpleasant situation of abuse and neglect. Today, as the city girds to enter a new millenium, the Passaic River is again a focal point, propelled by the construction of the New Jersey Performing Arts Center close to its banks and plans for the Joseph G. Minish Park along its western banks. According to one local authority on the early days, it was possible to catch shrimp and crabs at the Center Street Bridge. Just above the bridge was a famous place for catching striped bass and white perch. In those days, the water was beautifully clear, and you could see an object at the bottom at a depth of 10 or 15 feet. At approximately the same site where the three tiny boats bearing the Puritans landed in May 1666, a great new cultural center is being built. From the earliest times, both sailboats and steamboats used the waterway for commerce. While the railroads in the 1830s opened Newark up to commerce within the United States, and especially to the South before the Civil War, it was the Passaic which made it possible to transport Newark-made goods greater distances, even overseas. Hardly any panoramic view of the downtown waterfront appeared without a cluster of ships dotting the water. In addition to the coastal schooner which called at our docks, the steamboat made river history more than a century and a half ago. In 1830 a Hoboken proprietor sailed the 70-foot Olive Branch for a season. A few years later, Captain John Young and Caleb Neager purchased the Wadsworth, a 125-foot-long sidewheeler, which was never commercially successful. Abraham Zabriski of Saddle River owned the Proprietor, which traveled the Passaic from Belleville to New York on an alternate schedule. This operation lasted two years. By 1856 Captain William Tupper purchased a substantial sidewheeler, the Roatery, which he renamed the General Kembal. He offered it for sale for $5,500 in 1856, then founded a stock company. In the 19th century all types of clubs and boating homes emerged on the river, including the Mystic, Passaic Viking, Eccentric, Ariel, Eureka, and Triton clubs. The famous Woodside boat club was located near the old Greenwood Lake Railroad line. Seybold's boathouse was at the foot of Fourth Avenue. Jake Bowen's public boathouse was at the foot of Clay Street. In 1874-75, the Passaic River Amateur Rowing Association began a regatta, which it held annually until 1901, when it canceled the event because 'by that time the river had become so foul it was impossible to find young men to row in the river.' While some bravely attempted to use the river for recreational purposes, it was essentially lost for this purpose from this time on. The period from the Civil War era until the 1920s was marked by tremendous pollution of the once-pristine Passaic. An industrial inventory of Newark in the 1920s showed that we had become one of the nation's greatest manufacturing centers along with many accompanying pollution problems. In 1936, more than $100 million worth of machinery and machinery parts, paints and chemicals with clay products, creosite, calcium compounds, alcohols and tallow was exported. Imports included oil, gypsum, coal, tar and pitch. Obviously, with so much movement of so many raw materials, industrial spills along with sewage dumping resulted in polluted waters. Soon the number of pleasure boats, yacht clubs and swimmers disappeared from the river. By the 1930s, the regatta was a thing of the past and an influx of salt water seeped into the river. This affected both the commercial fishing industry and sport fishing, which had been so popular. In an attempt to clean up the river, which smelled bad, looked sluggish, turned the hulls of pleasure craft dark, and killed the local fish, the 1940s saw the arrival of local, district, state and interstate agencies coming to the rescue. Two of them were the Passaic Valley Sewerage Commission and the Essex and Union Joint Meeting (Committee). They made it their job to check for sewer leaks and factory discharges from the Great Falls at Paterson down to the Newark Bay Pumping Station, and to see that the 22 municipalities kept the Passaic clean. As a result, in the 1940s, a turn-around in the waterway's physical condition began. Today, the river's future is looking even better. With the creation of new greenways along the Passaic River Waterfront Park and Historic Area, a new chapter in our ongoing river romance is opening.